Why does the Moon appear round one night and invisible another? Is there a cycle to these changes? Where does the word "month" come from? What do we mean by "the dark side of the Moon?" Sometimes when we look at the sky at night we see the Moon as a sliver or half-circle. Sometimes it is completely round and sometimes we cannot see it all. Every month, the Moon passes through a cycle of changes called Phases. The Moon, like the planets, does not give off any light of its own, but reflects it from the Sun. Only half of it can be lit at any one time. Depending on its position in relation to the Sun and to us on Earth, the Moon takes on a different apprearance from night to night. 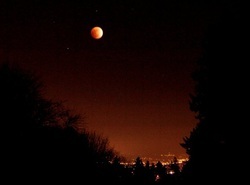 The cycle begins with the Moon complete in shadow - new moon. The lighted part of the Moon grows until we see the whole Moon reflecting sunlight. This is the full moon, at the halfway point in the cycle. The lighted part of the Moon then gets smaller, until it fades away into the new moon phase again, to complete the cycle. 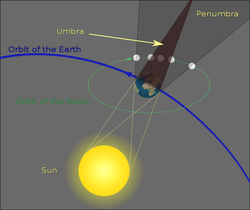 Eclipses are rare because the Moon usually passes above or below the imaginary line between Earth and the Sun. 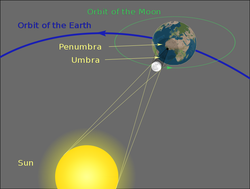 In the case of a Solar Eclipse, the Moon passes directly in front of the Sun. What appears to be a hole in the Sun is actually the Moon blocking its light from our view. When the Moon passes in front of the Sun, it casts a shadow. This shadow does not cover the entire Earth, only a small region.